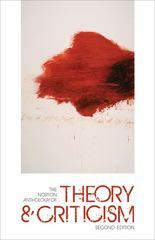 theclockonline students can sell The Norton Anthology of Theory and Criticism (ISBN# 0393932923) written by William Cain, Vincent B. Leitch, Laurie Finke, William E. Cain, Barbara Johnson, Laurie A. Finke, Barbara E. Johnson, Jeffrey Williams, John McGowan, T. Denean Sharpley-Whiting, Jeffrey J. Williams, John P. McGowan and receive a check, along with a free pre-paid shipping label. Once you have sent in The Norton Anthology of Theory and Criticism (ISBN# 0393932923), your Plymouth State University textbook will be processed and your check will be sent out to you within a matter days. You can also sell other theclockonline textbooks, published by WW Norton - College and written by William Cain, Vincent B. Leitch, Laurie Finke, William E. Cain, Barbara Johnson, Laurie A. Finke, Barbara E. Johnson, Jeffrey Williams, John McGowan, T. Denean Sharpley-Whiting, Jeffrey J. Williams, John P. McGowan and receive checks.